Published by Joshua Clare-Flagg on 9 Nov, 2014. 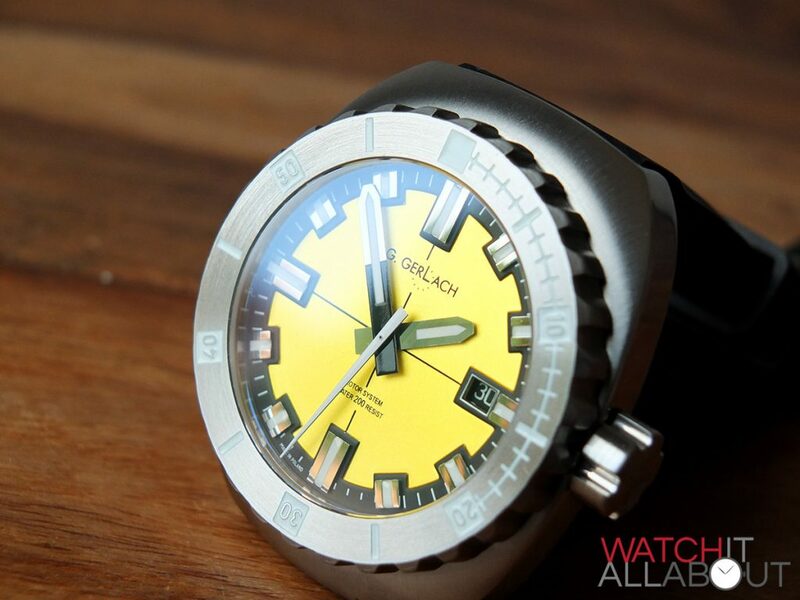 G. Gerlach need no introduction in the world of affordable watches. 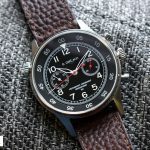 They’re fast becoming an extremely popular brand in the affordable watch circles, thanks to their great design and high quality construction for a reasonable price. 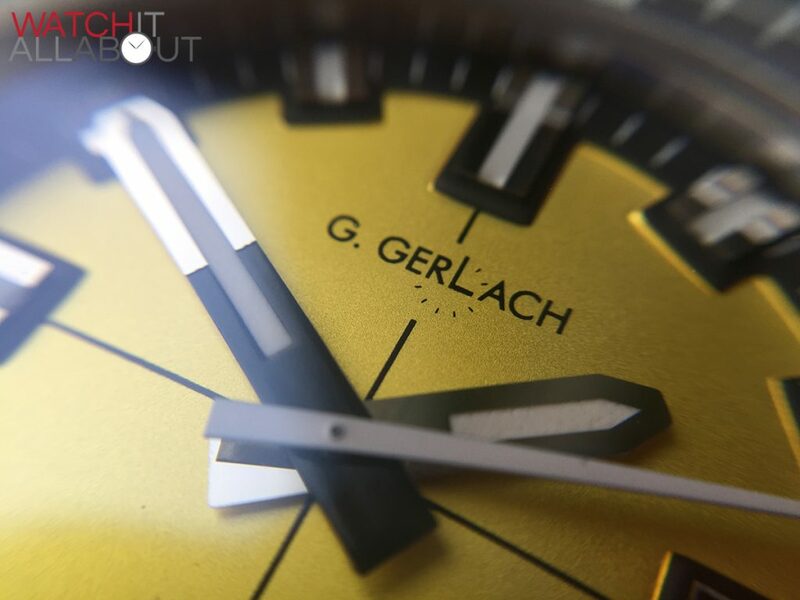 G. Gerlach was created by a group who wanted Poland to become better known in the industry world. 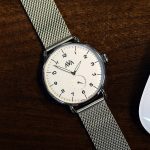 According to their words on their website: “Poland’s economy is not innovative – it’s just reproductive.” G. Gerlach wants to change this, by creating watches which are Made In Poland, known the whole world round. Thus putting Poland firmly on the map. So let’s take a look at the Otago. It costs 1169 Polish Zloty, which equals around £220 / $350. For that price you’re getting a well specced watch; with sapphire crystal, automatic SeaGull movement, 2 year warrantee, and the reputation of an excellent watch brand. 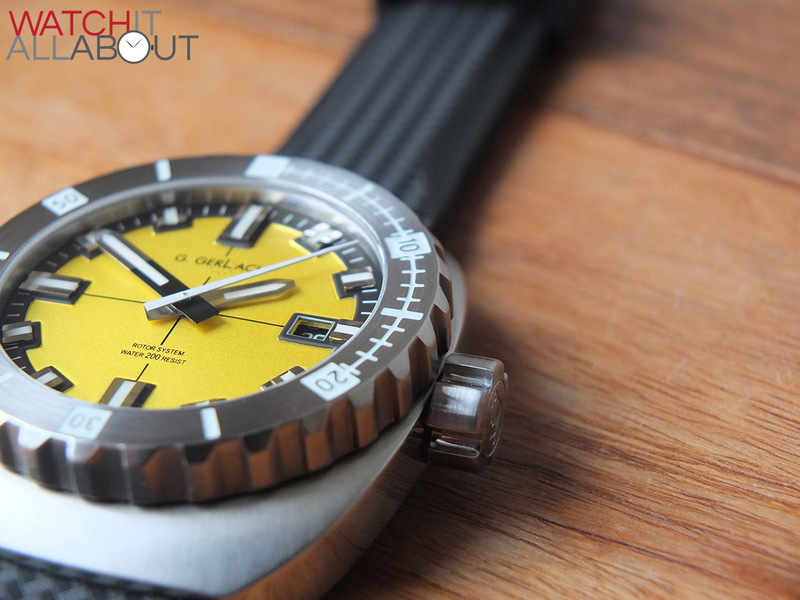 The Otago comes in a variety of colours, namely orange, graphite, yellow (the variant we’ll be reviewing) and blue. Let’s see if it holds up well under closer inspection. 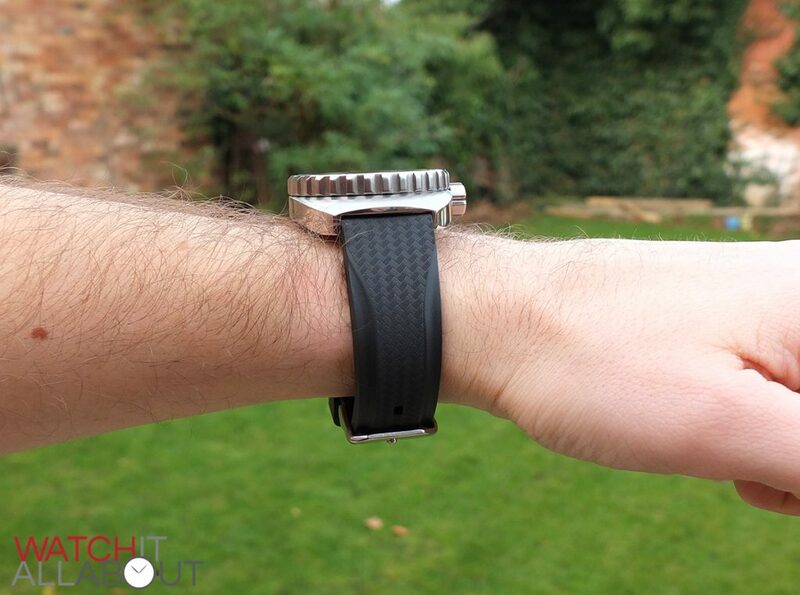 The case is a very distinctive shape, measuring 42mm in diameter, with a 50mm lug to lug length – so it’s quite a beast. 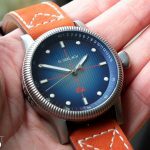 It’s a very 70s retro barrel shape case – the main design feature I feel is how the lugs cover the top of the strap ends. This makes the Otago look larger than it is due to the flat bottoms, although it still fits my 7.5″ wrist perfectly fine with no issues in being oversized. The height is 15mm, which may cause issue for some during casual wear. It does sit pretty high, and it can be a struggle fitting it under a cuff. But that’s the price you pay for buying a tank-like watch. The Otago weighs in a 150g on the silicone strap, which is super heavy – this is a testament to how chunky and well made this thing is. When you have it on your wrist you definitely know about it. 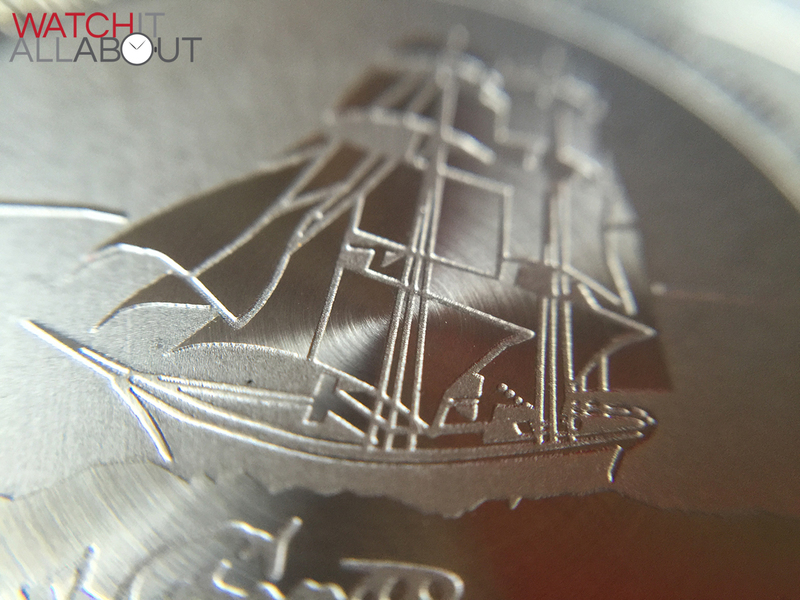 The majority of the case is a brushed finish, only the two sides are polished. I love the brushing on the top of the case – it’s all in a outwards starburst direction, rather than straight upwards or sideways. This is the first of many lovely touches of pleasant subtle design and high attention to detail. All of the finishing of the case is excellent – the polished finish is spotless, and the brushing is superb, thanks to the starburst effect. Where the two different finishes meet together, the join is neat and refined. The machining of the case as a whole is good too, especially considering its unique shape. The screw-in crown on the Otago is larger than normal, measuring 9mm in diameter and 5mm wide, although surprisingly it doesn’t dig in to the back of your wrist or arm whilst wearing it – thankfully. It’s fully brushed, bar the insides of the grip’s teeth which is a pleasant level of detail that could have easily been overlooked. These huge teeth acting as grip are excellently machined, with definite corners and equal depths. They do their job well, offering good grip on the crown to unscrew and adjust it. 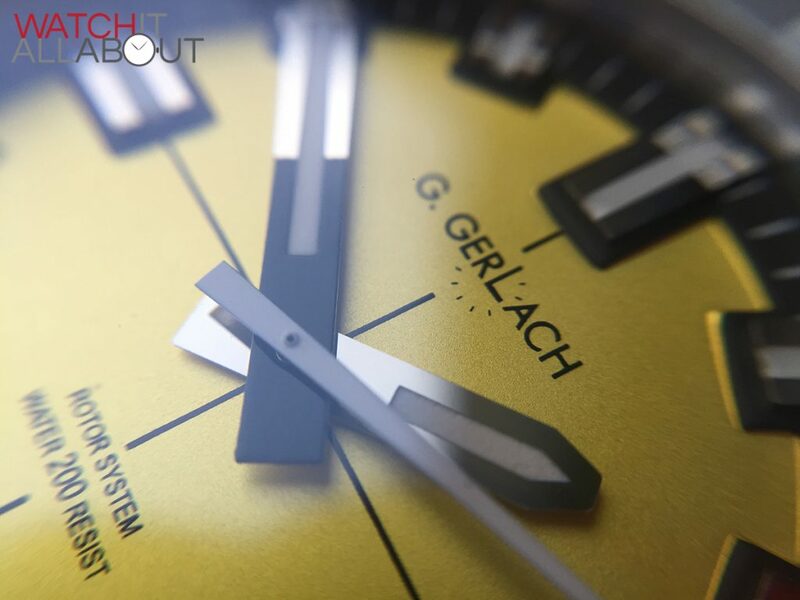 The crown has the G. Gerlach logo engraved on the end, pleasantly deep and thick. The thread is evidently high quality and seems to last forever when you’re unscrewing it, reassuring you of the Otago’s 200m water resistance. 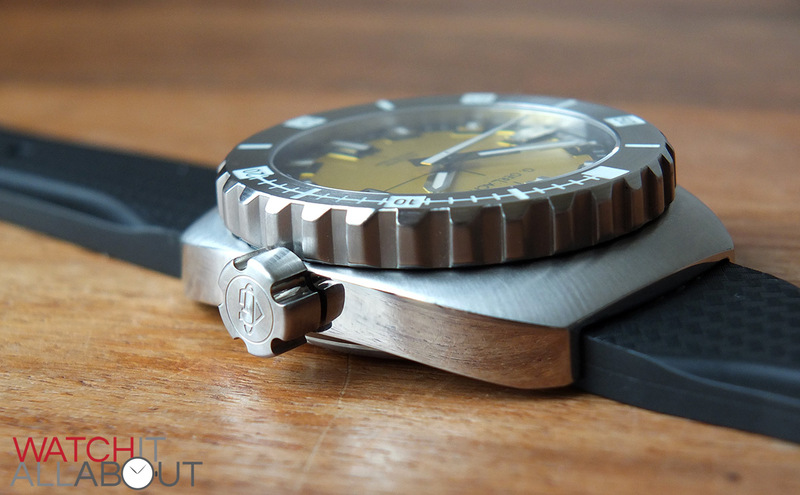 The bezel is in a similar vein to the crown; chunky and tool-like with epic grip. 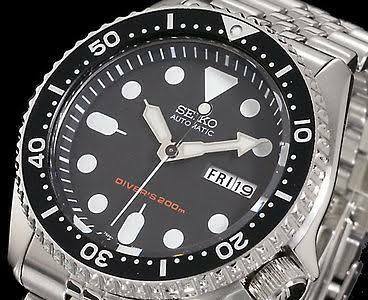 I really like the shape of the grip on the outside edge of the bezel, each tooth looks like a shark fin pointing anti-clockwise. This is probably the most effective grip I’ve ever come across. As you’d expect, it’s made beautifully and looks quality. 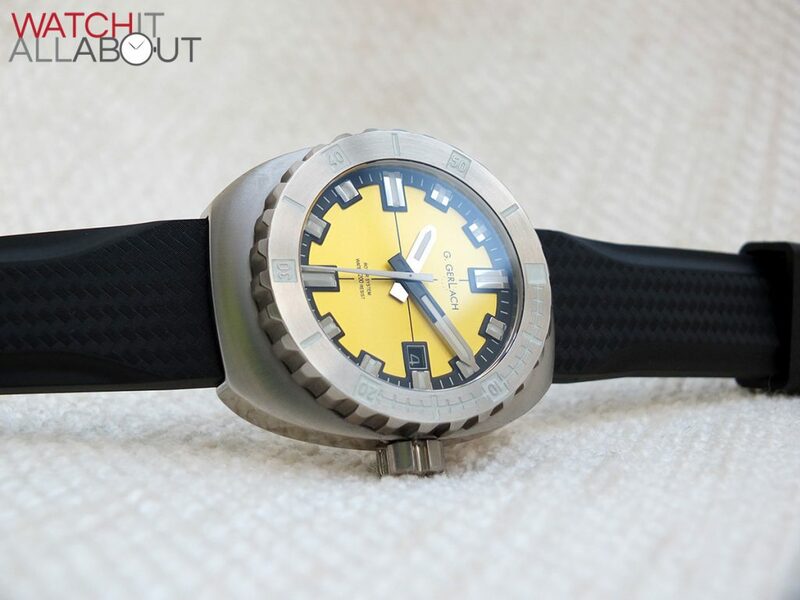 Here’s another nice positive – the bezel markings are all lumed. The engraving is accurate, especially around the small numbers, and the lume is filled evenly. 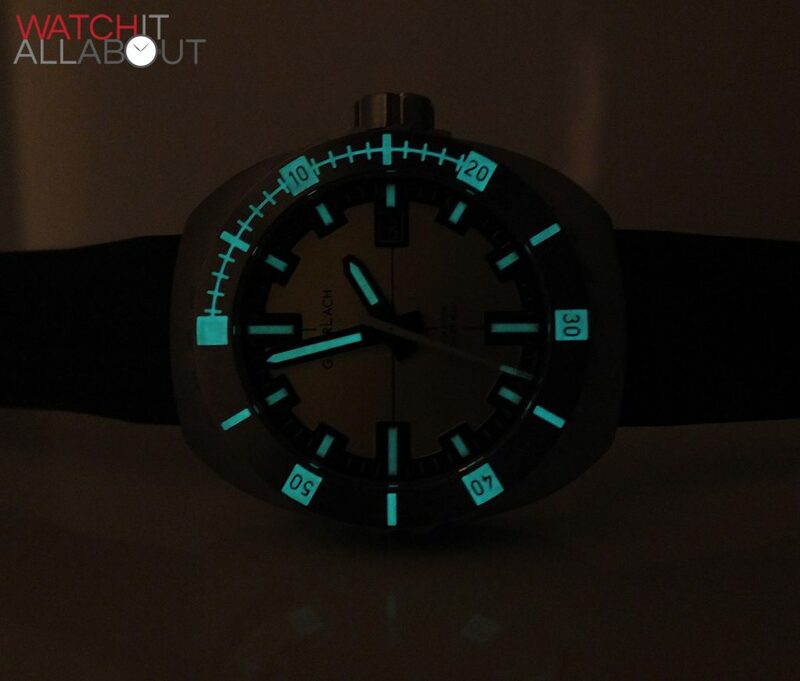 The lume itself is strong, glowing brightly and charging without any problems. 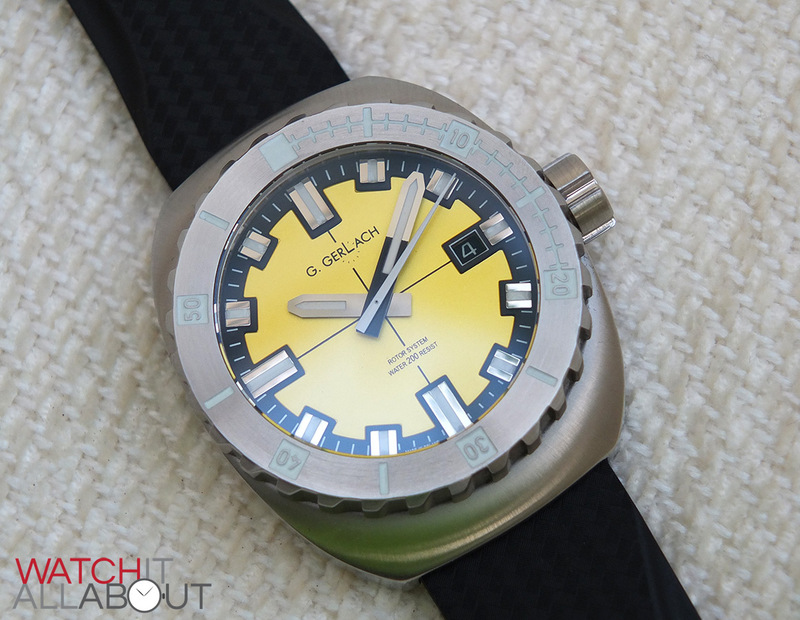 The one problem with the bezel, and indeed one of the only negatives of the Otago is the bezel action. It’s extremely harsh, feeling almost as if there’s sand in it, and makes you wince as you use it. This is a shame, but it does work, and it’s fairly easy to use too – it’s not as if it’s really hard to rotate. Interestingly, it does rotate both ways, whether it’s supposed to or not, I’m not sure. The bezel has a perfectly flat top, which lines up absolutely with the top of the flat sapphire crystal. The crystal is wonderfully clear, thanks to the highly effective anti-reflective coating on the underside. Thanks to it being flat and not curved, you get good visibility from any angle without distortion. It’s really that impressive, it makes viewing the watch a delight, especially when you catch the light on the hands and applied indices. 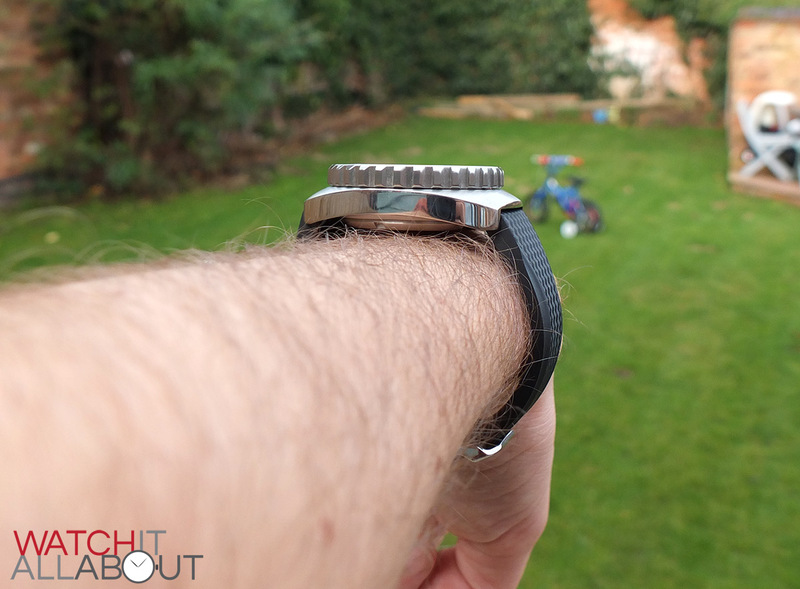 I particularly like how seamless the link is between the tops of the crystal and the bezel. 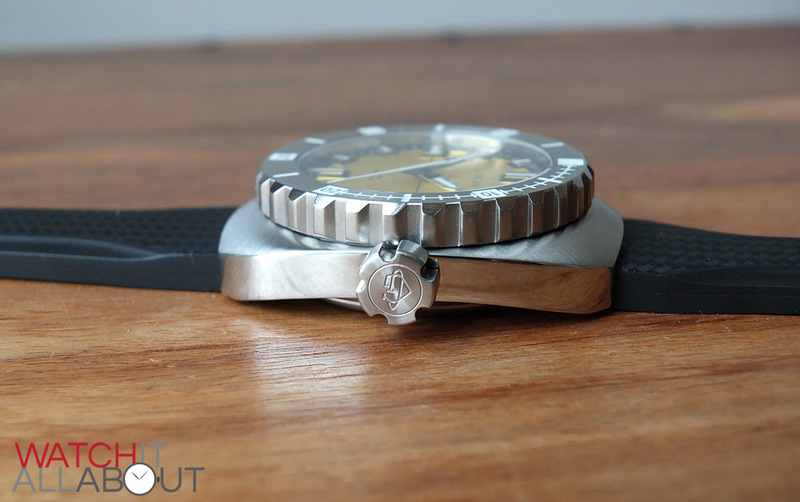 The caseback is another impressive aspect of the Otago. 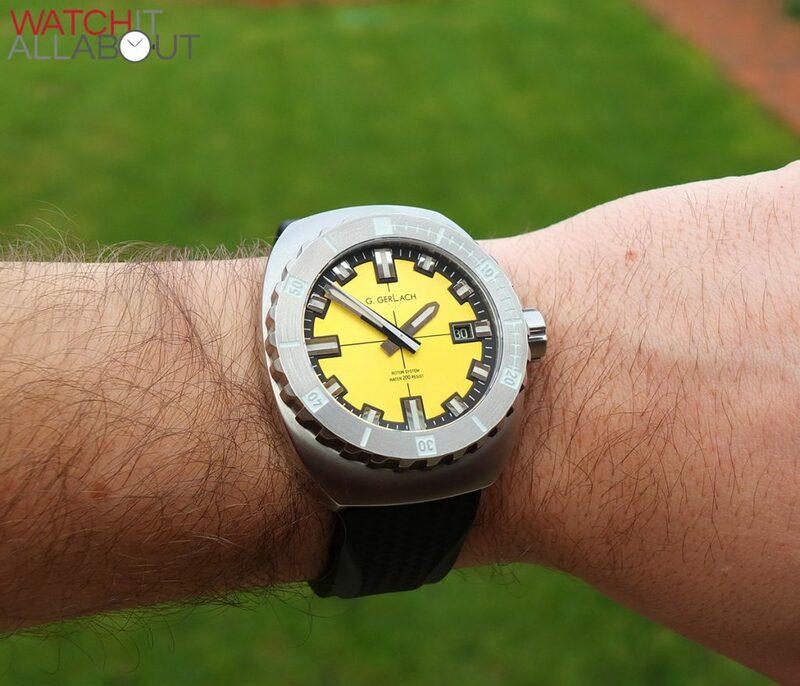 It’s screw-in, as you’d expect from a divers watch. It’s fully brushed, and has a delightful drawing of the ship Otago, plus Joseph Conrad’s signature. Surrounding this is the watch specifics, such as the water resistance, serial number, sapphire crystal etc. Imitating the case as a whole, it is exquisitely engraved, even the very finest and intricate points. A highly impressive case back. 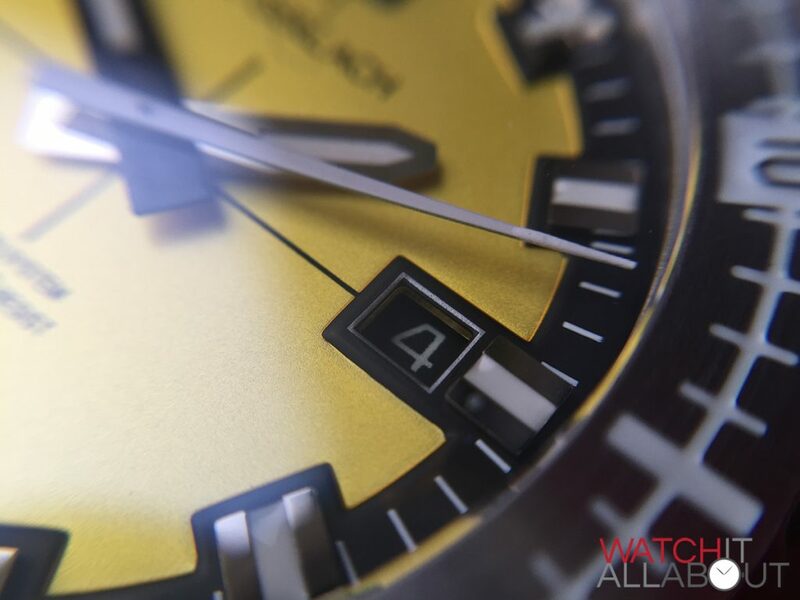 The case in general is indicative of a watch of much greater cost. 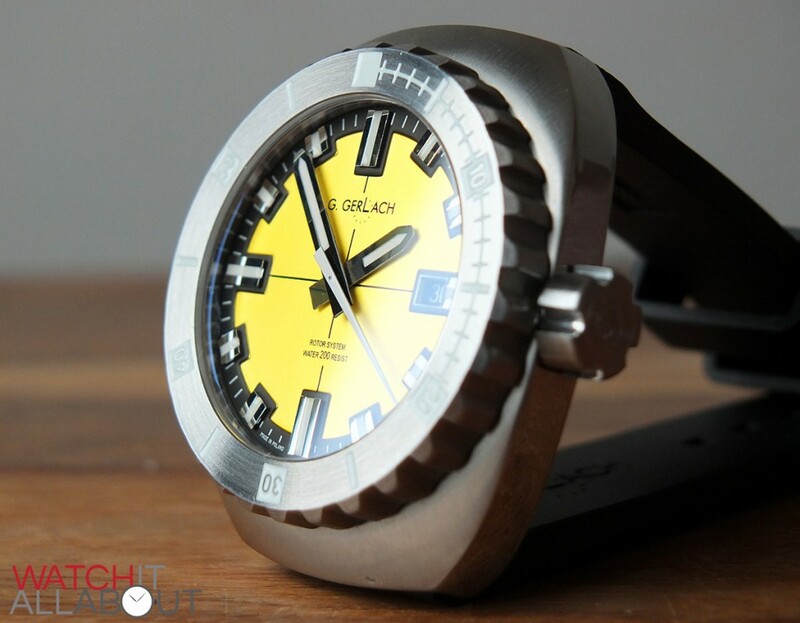 G. Gerlach have done a fantastic job of creating such an impressive refined beast for £220. The G. Gerlach Otago comes in a variety of colours, the yellow and blue being the latest to be released. 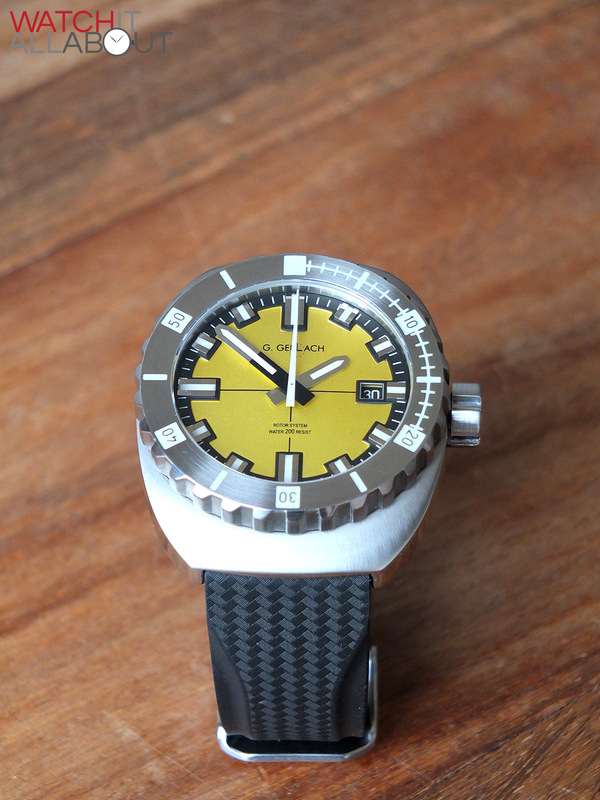 As a divers watch, the bright colour of the yellow dial and the contrast with the thick hands offer excellent visibility. I love the colour too – it’s not a harsh luminous yellow, but rather has a much more classy, elegant golden hue. 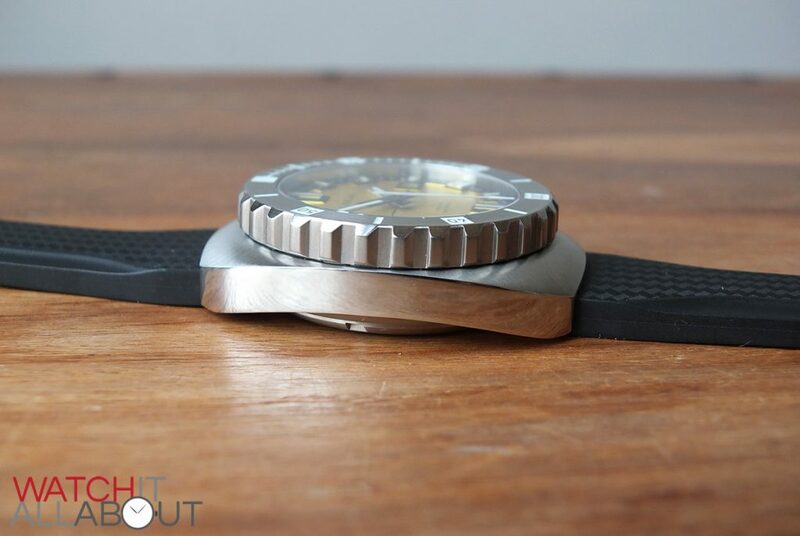 This allows you to be able to wear the Otago in a casual setting easily without looking like an idiot. 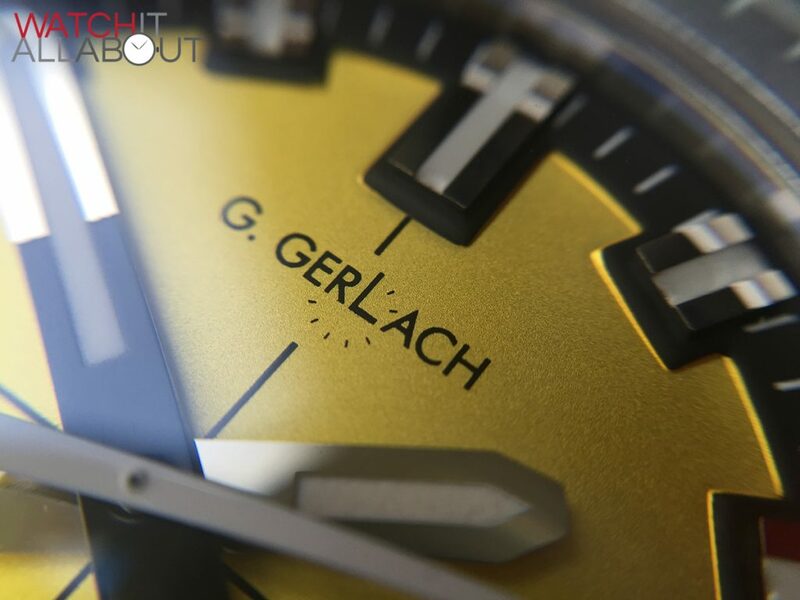 The printing is all done with pinpoint accuracy: The dial features the G. Gerlach logo in the top half, which is just the right weight – not too large, bold or overpowering. It has “Rotor system” and “water 200m resist” in the bottom half. 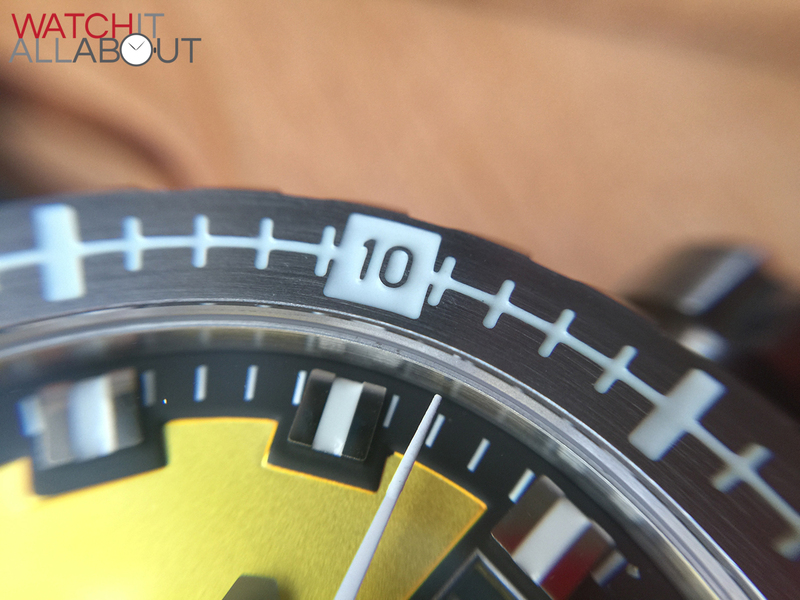 The dial also features a thin set of crosshairs, breaking it up into quarters and keeping things interesting. The date window is located at 3 and is incorporated into the slightly raised outer track housing the minute markers and applied hour indices. The window is pleasantly done – it’s not just a hole cut into the dial, but rather it has a precise white border around it. 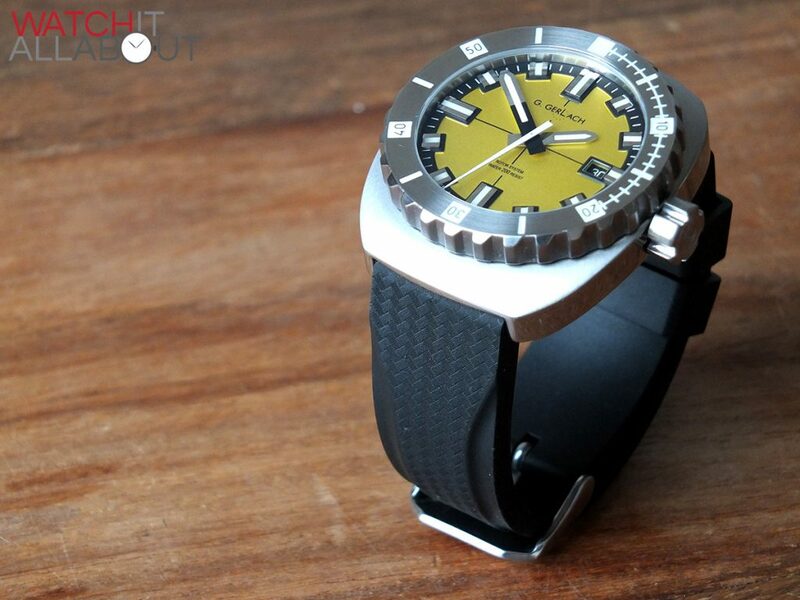 One thing you rarely see on affordable watches is a date wheel that isn’t white. This is because alternative colours are harder to get and therefore more expensive. Thus, usually even if the design calls for it, they’re never changed to match. It’s pleasing to see that the date wheel on the Otago is black, to match the window surround and the watch’s design. The white printed date numbers are spot on and in a font that matches the style of the watch. 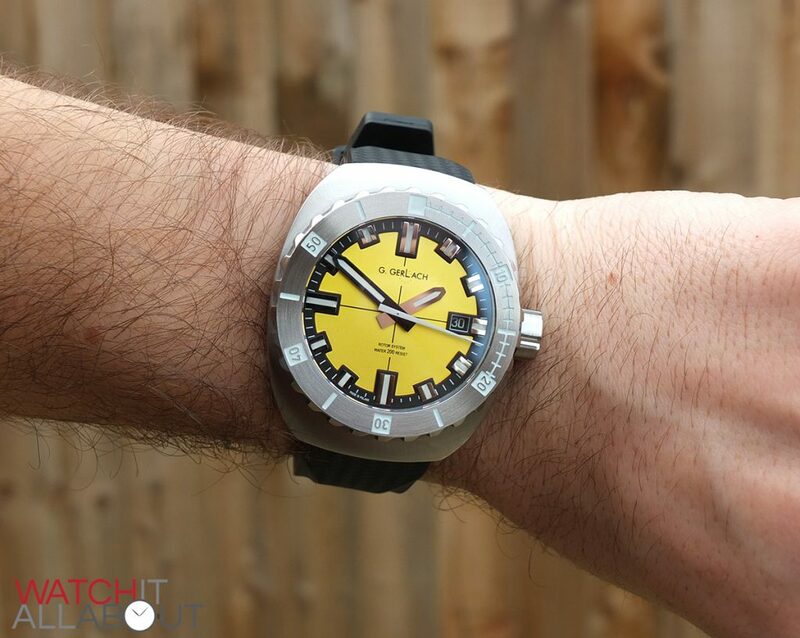 The hands are chunky batons with points on the end, providing good visibility against the dial. The hour and minute hands are both polished, bar the bottom half of the minute hand, which is black. 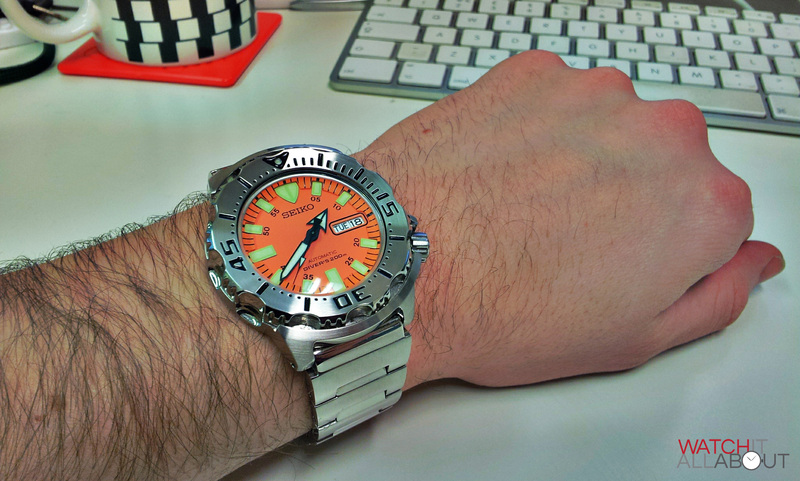 They both have a lumed channel down the centre, which is of similar impressive strength as the bezel. The second hand is a long pointed arrow, and is white. They are all made spotlessly, and I do very much like the design of the hands. I feel it matches the hefty feel the whole watch well. 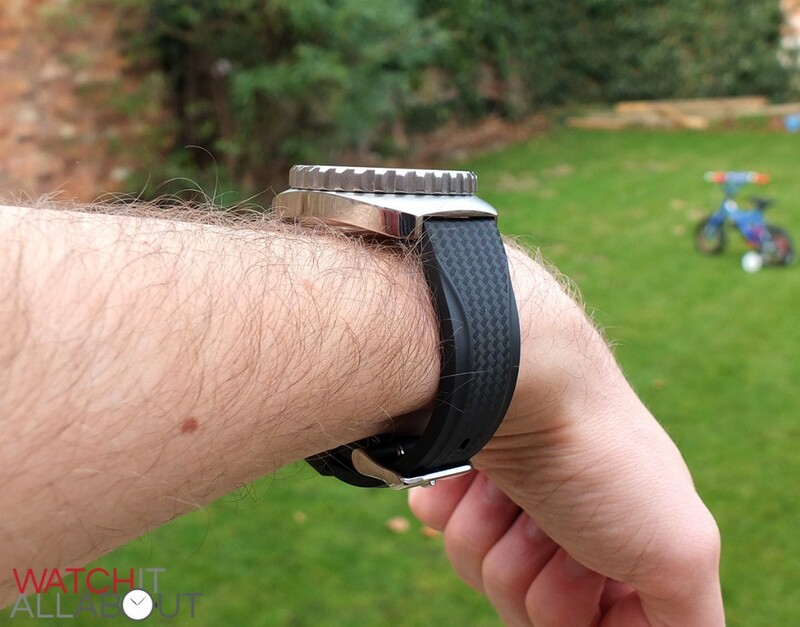 It would look completely wrong if a watch like this had thin, feeble hands. 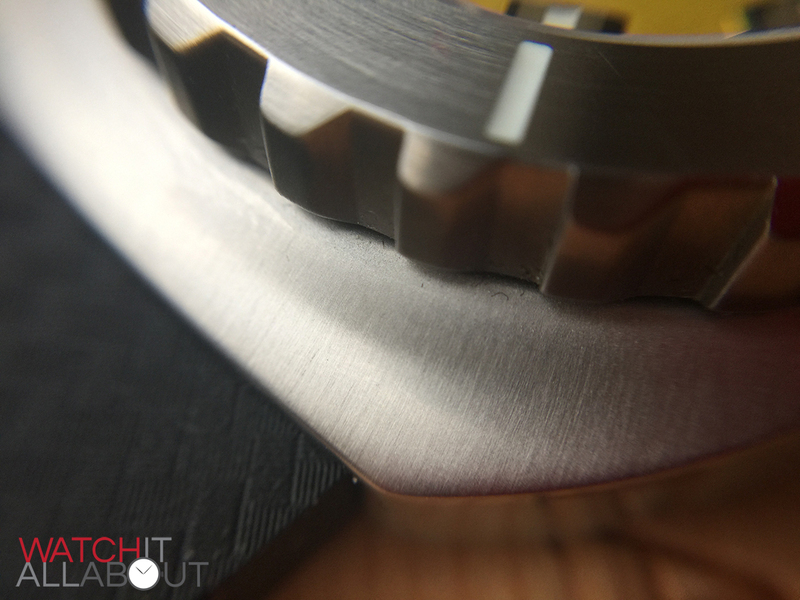 The outer track provides a small sense of depth, thanks to it being applied and therefore on a higher level than the main section of the dial. The white printed minute track sits neatly within this dark grey surround. Each hour marker is also located in the outer chapter ring, which extends out to necessitate them. 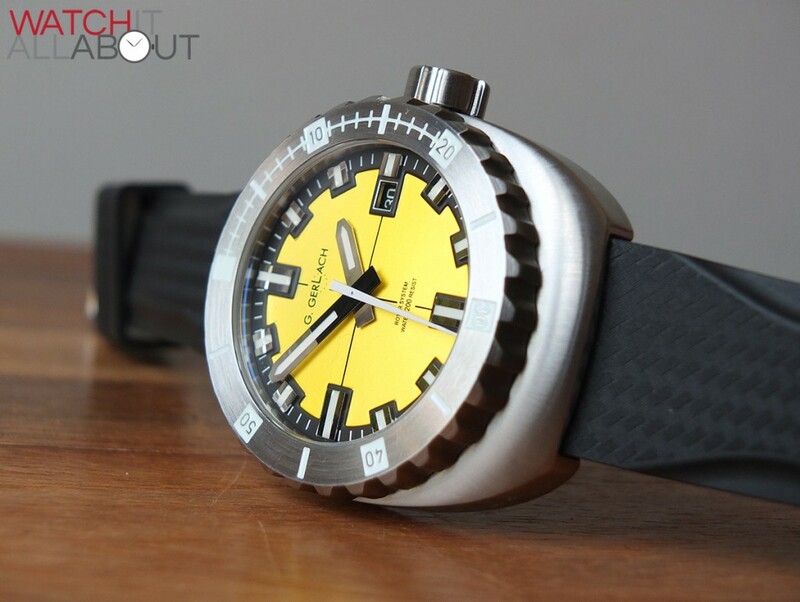 This mimics the extreme tooth design of the crown and bezel, allowing the heavy duty tool / diver ethos of the Otago to flow through. Each hour marker is designed to look like a cross-section of the minute and hour hands – two thick polished steel edges down the sides, with a strong lumed channel in the centre. All of the hour markers are finished to perfection, with no markings on whatsoever. Because of the thickness of the polished hands and indices, the Otago really looks stunning when they all catch and reflect the light just right. And thanks to the clarity of the crystal, you get to see it perfectly. I’ve been positively impressed with the high level of detail and pinpoint accuracy of the Otago so far, and the dial definitely didn’t disappoint. The strap measures 22mm wide at the lugs, reducing to 20mm at the buckle, which feels like the correct proportion for the Otago. It is a gum / silicone strap, with an incredible vanilla smell that is actually very pleasant. You get the occasional whiff of it whenever you move your wrist around. 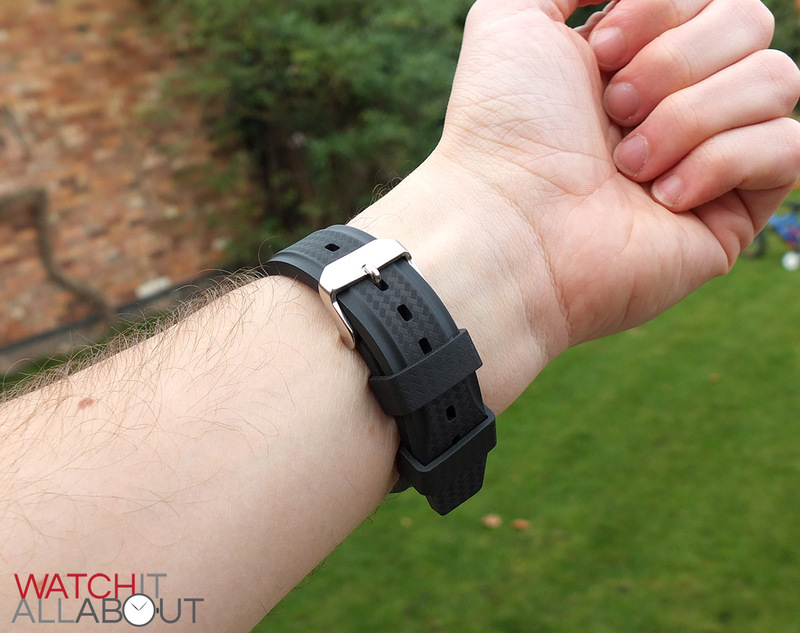 The strap is excellent quality; it’s soft to the touch and pretty thick too at 4mm – but also surprisingly supple and malleable considering this. 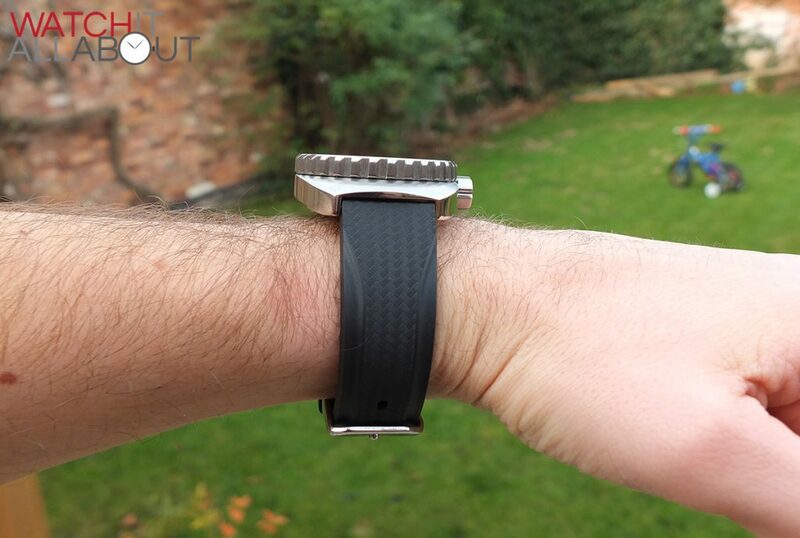 The soft feel means it’s comfortable on the wrist and doesn’t rub or irritate the skin. The thickness does mean that it will take a little while to break in as it is a little stiff to begin with. 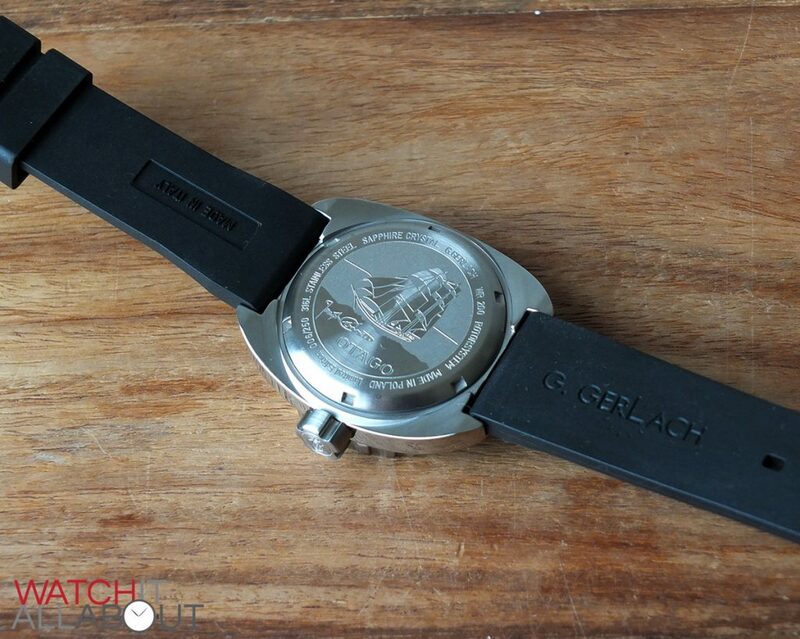 The strap has “Made in Italy” and the G. Gerlach logo moulded on the bottom on either side, accurately and neatly done. 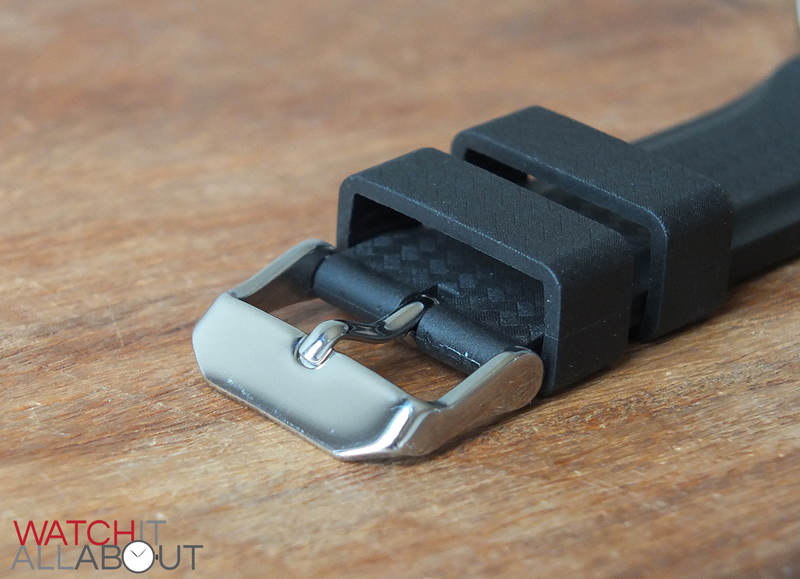 On the top of the strap is a sporty carbon fibre texture, which isn’t the usual thing you see on a divers watch. Still, I think it suits the style and design well and looks good. The pattern is gentle enough to not be too overpowering or attention grabbing. One thing I would have liked to see is a little more effort put into is the buckle. It’s plain polished steel, with no markings or engravings at all. 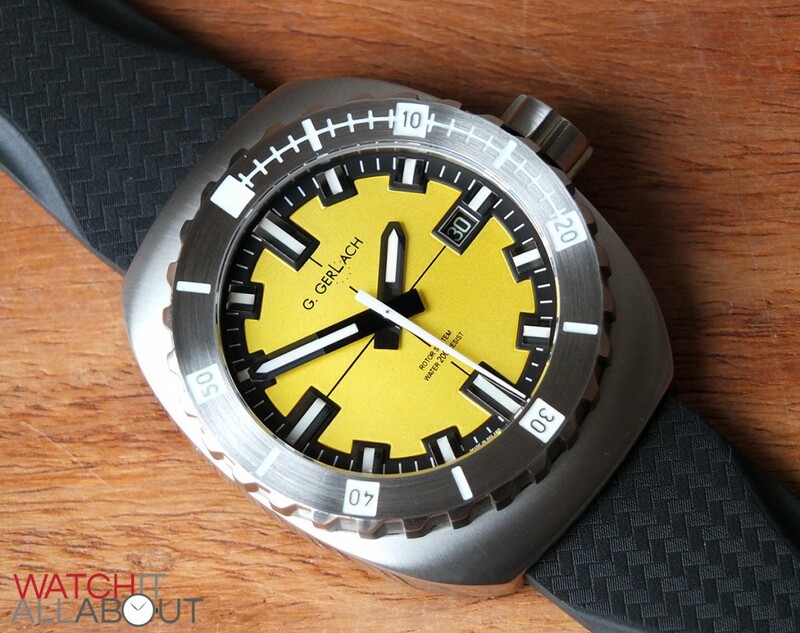 Personally, I think it should be brushed rather than polished, to match the case; and then it should at least have G. Gerlach or the G logo etched into the top bar – because at the moment it seems to be an afterthought, almost as if it was the buckle that came with the strap, and nothing was done with it. The strap itself is clearly a high quality silicone strap, which not only looks and feels good, it also smells pretty nice too. Yum. 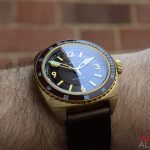 The movement powering the Otago is the Seagull ST25: A no-nonsense workhorse of a movement from a brand which is popular with affordable watch manufacturers. 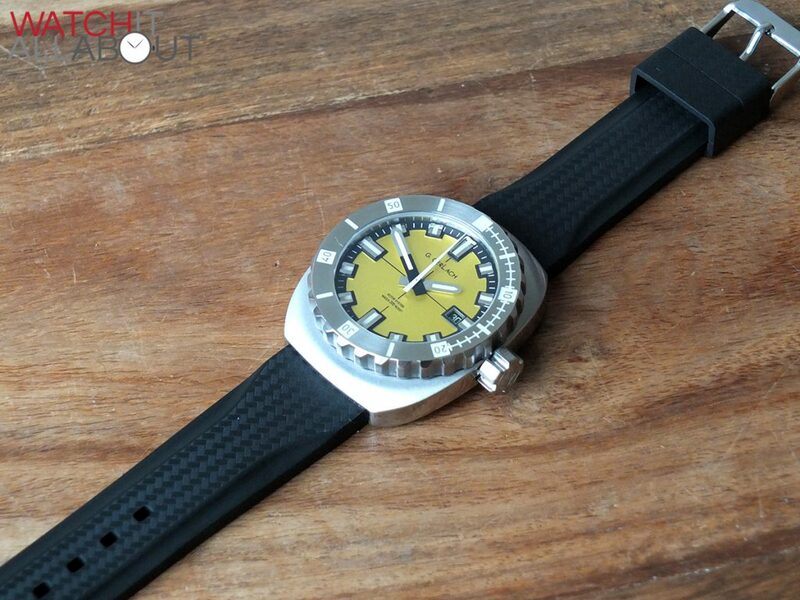 The ST25 is an automatic movement, running at 21.6k bph (which beats 6 ticks per second). 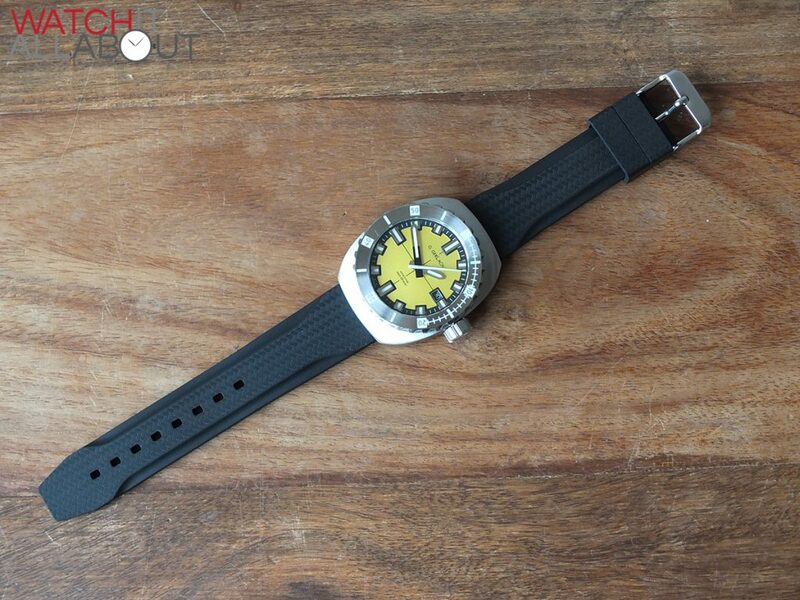 It has a date function, can be hand wound, and has a hacking second hand. It feels very sturdy in the hand when changing the time and date, reassuring you that it’s well put together. Whilst it’s quiet when it’s running, you can hear the rotor spinning quite loudly if you’re somewhere quiet and move your wrist quickly. The accuracy is proving to be very good too. I’ve measured this one to be 8 seconds fast a day. Considering a COSC certified chronometer is regulated to 5 seconds a day, I’ll happily take an extra 3 seconds for a watch that costs £220. 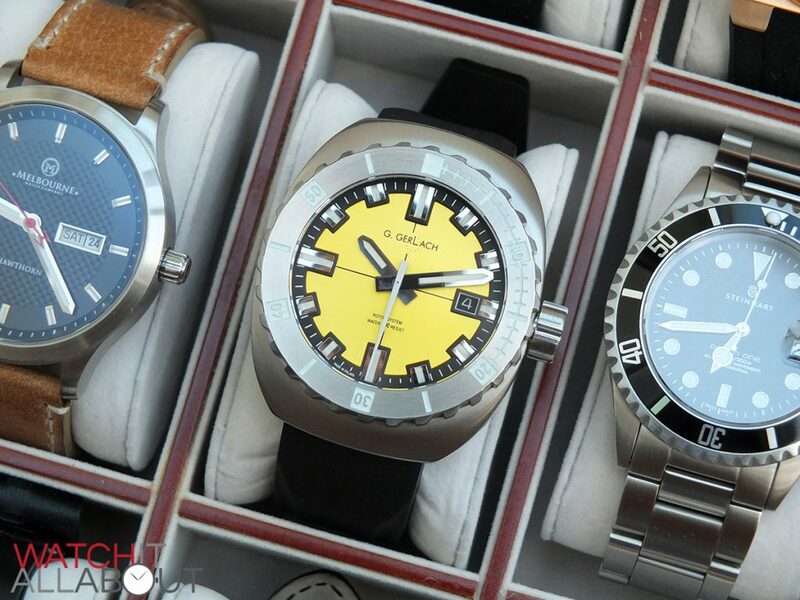 Like any affordable diver, the main competitors are always going to be Seiko offerings. 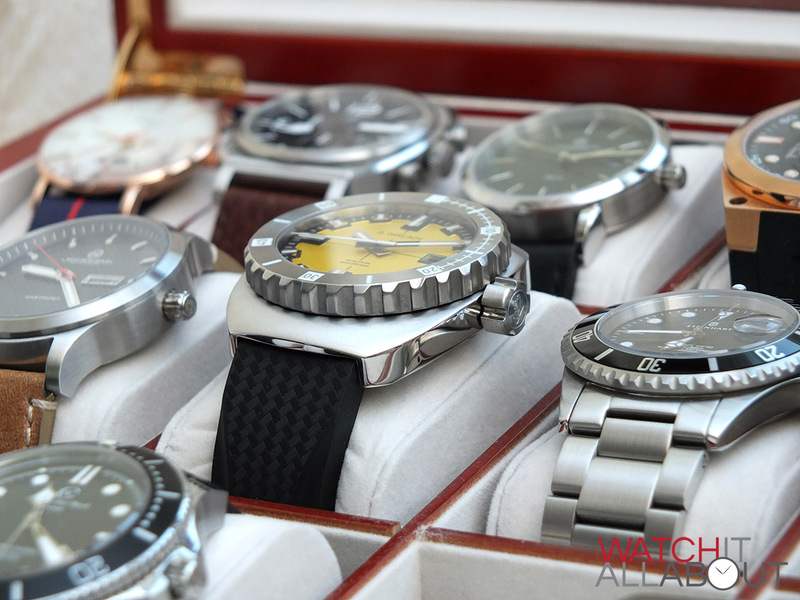 The two that come to mind are the SKX007 and the Monster – both of which are excellent watches in their own right. However, they do appear a lot and aren’t that exclusive or unique anymore, unlike the Otago. 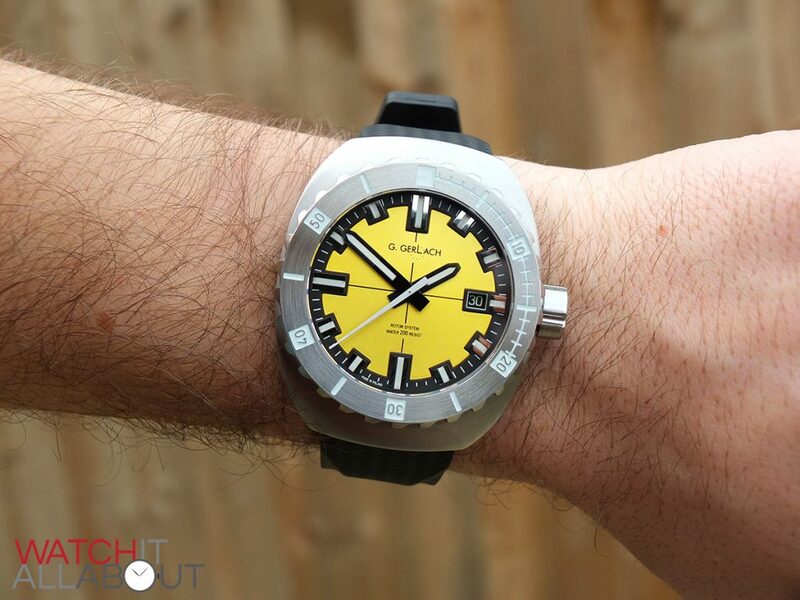 In terms of specs, the Otago can say that it has sapphire crystal vs hardlex, and a movement with a hacking seconds hand, allowing you to set it with greater precision. But at the end of the day, any of these watches are excellent. I’ve really grown to love the G. Gerlach Otago. 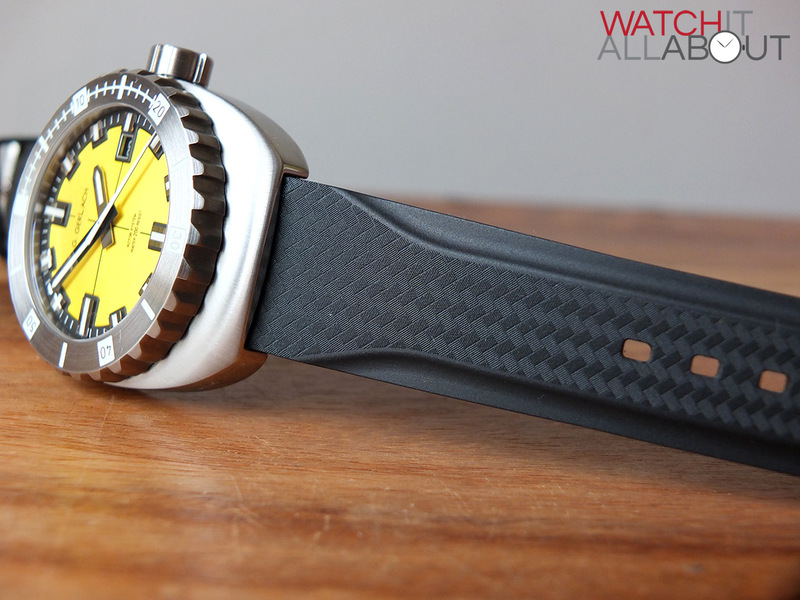 It oozes a refined industrial feel to it, which is a neat trick for a divers watch. 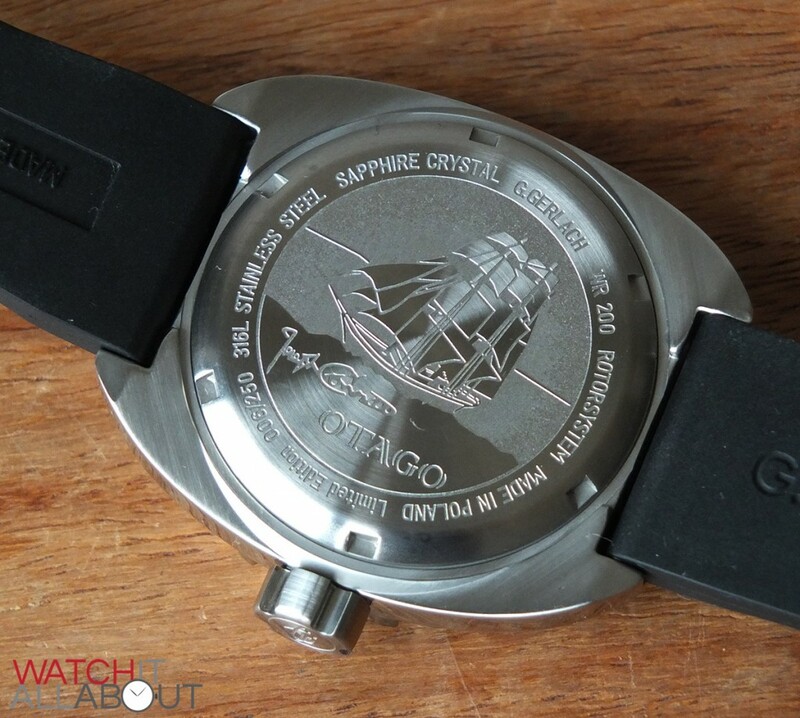 The fit and finish of the case is excellent, as is the execution of the dial. The delightfully clear sapphire crystal tops it all off. Something I haven’t mentioned before is the lovely wooden box the Otago comes in, plus the inclusion of a strap pin removal tool. These are lovely little features that make the experience of owning a G. Gerlach all the better. The only negative is the bezel action. Whilst it does work, it’s not a pleasure to use and the first time you do you’ll probably go “urgh” as I did. Still, I don’t think it’s something that should stop you from buying it. 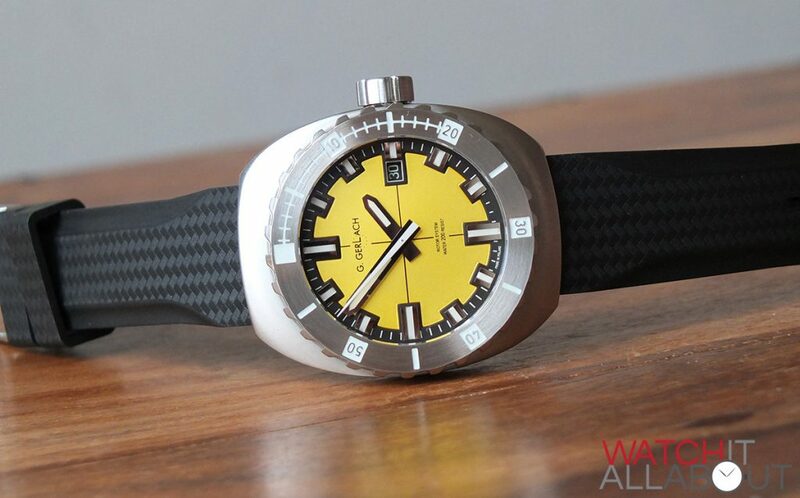 I would definitely recommend the Otago to someone seeking a chunky diver, which is an alternative to a Seiko, that can pass off as a casual watch. At £220, it offers brilliant value for money, plus you’re supporting a wonderful small brand from Poland. 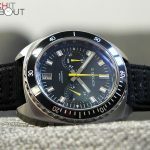 Hi Joshua, I just checked G. Gerlach’s site and they claim that the bezel is supposed to rotate in both directions “for the user’s convenience”. Dunno though if it is not just a marketing trick to powder the imperfection. 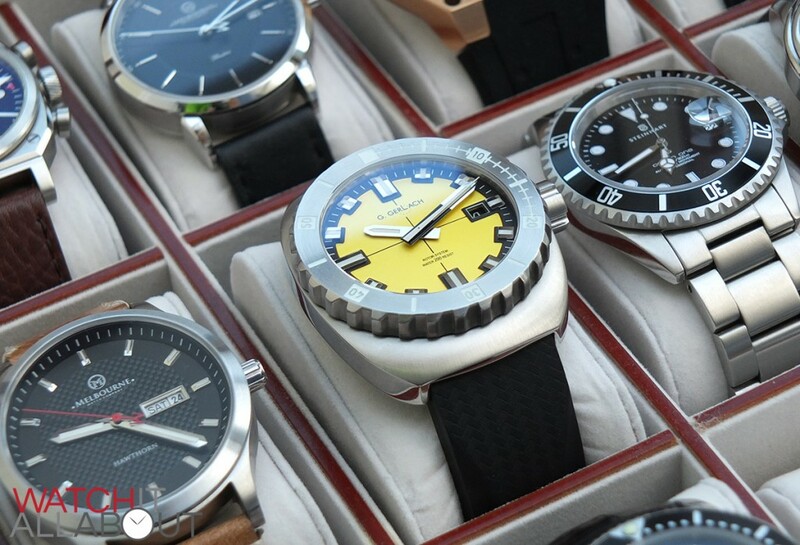 Alas, I do love all their watches, especially the “aviator” series, styled after airplane dials. Hi there! i saw this review like a year and a half ago and the otago totally caught my eye, but here in Mexico erupean micro brands aro so hard to get, fortunately found one on ebay weeks ago and purchased it. 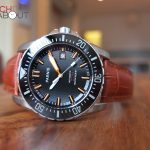 I’m wearing it right now and feels great, mine is orange with black leather strap and orange stitchings and the buckle is also brushed, i guess they read your review, anyway, thanks to you i discovered a great brand and an excellent detailed watch!